If you’ve read the Autumn Streaming preview that went up on the site a couple of weeks ago, you’ll know that we at Anime UK News are fans of the anime adaption of Bloom Into You. Today I’m here to check out the first two volumes of the original manga series to see how it compares. Our story follows protagonist Yuu Koito, a first year in high school who dreams of experiencing the love found in shojo manga and love songs. Yuu thought her time had come when, in junior high, a classmate confessed his feelings for her, but instead Yuu was left feeling nothing in particular. As Yuu starts high-school, she enters the student council for a lack of interest in joining a club. There she meets Touko Nanami. Having witnessed Touko skillfully shoot down a confession of love, Yuu wonders if Touko’s heart is also unmoved by romance the way hers is and that perhaps the two can be friends. However, when Touko reveals to Yuu that she’s fallen in love with her, Yuu’s left confused by what love really is and whether or not she can be with Touko. Although Bloom Into You is a yuri series, the story it’s trying to tell is a lot less about girls being in love and more about what love even is in the first place. Yuu doesn’t understand why confessions of love don’t set her heart a-flutter, and even when she and Touko share a kiss, Yuu feels nothing. Over the course of these first two volumes we follow our protagonist as she slowly begins to realise that maybe not reacting to love the same way as girls in shojo manga do isn’t such an unusual thing. Ultimately, it’s not that Yuu has no feelings for Touko, it’s just that hers aren’t expressed in the same way. Not only does she want to spend time with Touko, she wants to support her and stay near her too. Her feelings clearly go deeper than just friendship but that’s something that’s more apparent to me/us as readers than it is to Yuu – at least to begin with. On the other hand, we have Touko, who reveals that she’s shot everyone down who’s confessed to her because, like Yuu, they never made her feel anything. Meeting Yuu is the first time she’s ever experienced real feelings of love, and she’s completely smitten. Touko wants to date Yuu and do all the things that couples usually share, but first she has to figure out how to make Yuu fall for her (or accept that she has feelings for her). It’s a learning experience for both of them but for Touko it’s more about not letting her feelings get the better of her and scaring off Yuu. Overall, I really like the story that mangaka Nio Nakatani is trying to tell here. In reality love comes in many different shapes and sizes, but if you’ve only ever been exposed to it within the context of shojo series or hollywood movies it seems like this huge, life changing event. The feelings Yuu has are very true to life, but so too are Touko’s more powerful ones. I like the balance that comes from having the two main characters on different ends of the scale, and being able to read the first two volumes together really helped solidify those feelings. Bloom Into You doesn’t shy away from anything and works hard to be a thoughtful and realistic look into what love is. If you’ve been watching the anime adaption of Bloom Into You then you’ll know how wonderful the animation Troyca is providing is, but Nakatani’s artwork is fantastic as well. Character designs are attractive, but not so much as to be unrealistic, and Nakatani puts a lot of work into drawing and shading the various backgrounds. Every panel is a real marvel to look at and fans coming from the anime certainly won’t be disappointed in what they find here. 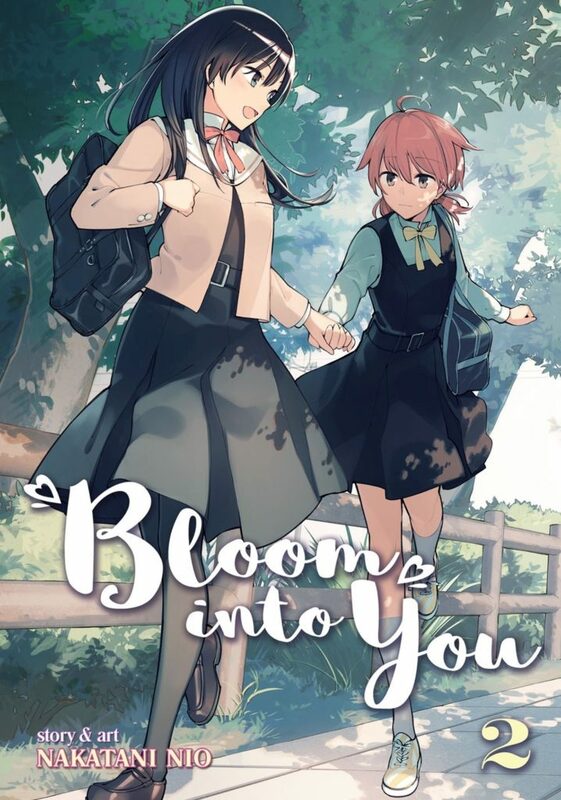 Bloom Into You comes to the west thanks to Seven Seas Entertainment, who have been releasing it in print since early 2017. They also recently brought the five volumes they’ve released so far in English to digital platforms. Translation has been handled by Jenny McKeon and is problem-free and reads well. Both volumes also have colour inserts at the start, which are really colourful and striking images. Overall Bloom Into You is a thoughtful look at both what love is and how it can differ person to person. Even if you’re not usually a fan of yuri series, I’d highly recommend checking this one out, given how strong the story and its characters are. Regardless of your feelings on love, I’m sure you’ll find something to relate to. If you’re not interested in a horrifying take on classic fairy tales then there is little of interest to set this series apart from the crowded genre. However, fairy tale fans looking for something different are sure to have a great time with this dark take on some of their favourite stories!